Unmanned undersea vehicles (UUVs) trace their history to the Special Purpose Underwater Research Vehicle (SPURV) developed by the University of Washington’s Applied Physics Laboratory in 1957. While the UUV was conceived decades ago it was the remotely operated undersea vehicle (ROV) market, with offshore oil and gas providing a significant driver, which initially saw significant technical and product developments. It was not till the late 1980s and early 1990s, that UUVs began to be noticed again. New, lower cost, autonomous vehicles leveraging the latest computer hardware and processing, as well as sensors from ROVs, began to appear in academic research labs. During this period large U.S. defense contractors such as Boeing, Lockheed Martin and Northrop Grumman led various Navy program development efforts. As the 2000s opened, technologies from the academic labs and research institutions transitioned to start-ups. These firms began to deliver UUVs as products. While volumes were small the market for U.S. and international defense, scientific and commercial clients was becoming viable. In the past decade the market has grown steadily. U.S. Navy multi-year programs for both UUVs and long-endurance gliders had significant impact. Meanwhile commercial oil and gas expanded to deeper fields where large UUVs compete well in surveys, such as those for pipelines or cable routes. Also during the past decade environmental monitoring requirements have expanded. Fortunately scientific users inspired innovation in smaller UUVs and increased adoption of both long-endurance gliders and compact, relatively affordable UUVs. The market became robust. To date, military use of UUVs has largely been driven by explosive ordnance disposal (EOD) requirements. While these operations have used smaller vehicles, especially systems of roughly 12 to 21 inches diameter with lengths up to 20 feet, the current trend in the U.S. Navy is to look to even larger, more capable and costlier UUV platforms that can store enough energy to operate for longer periods. This is most notable in recent interests in large displacement UUV (LDUUV) and even extra-large displacement UUV (XLUUV) concepts. Throughout this history, UUVs have typically evolved slowly, driven by a combination of bureaucracy and risk tolerance that was not always friendly to agile and innovative technology development. Product development cycles could be measured in years and even commercial delivery times are typically many months. Typically the cost of a basic UUV, without payloads, was at least equal to the cost of the sensors required to complete meaningful missions, if not multipliers of the sensor costs. The combined platform and payload budget can quickly exceed $1 million, even for these medium sized platforms. Another notable feature of the traditional UUV market is a general trend toward larger sizes being necessary to provide greater range. Recent developments in UUV technology are changing the field. 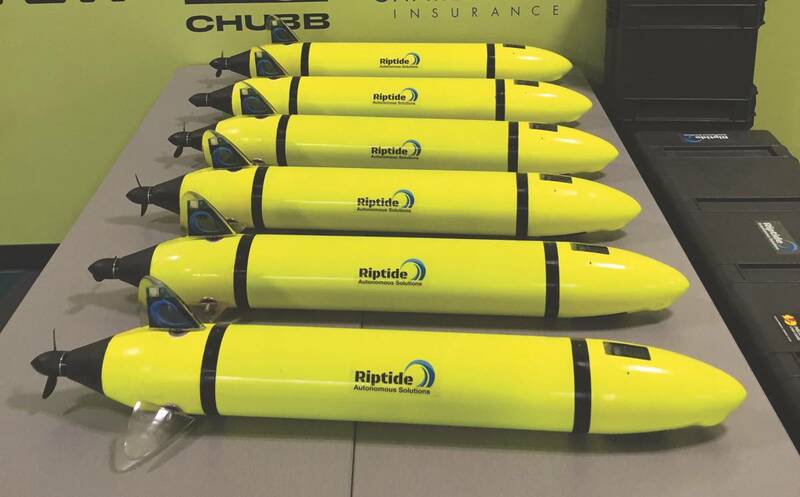 In 2015, several veterans of the conventional UUV sector set out to change the dynamics of the industry, founding Riptide Autonomous Solutions. 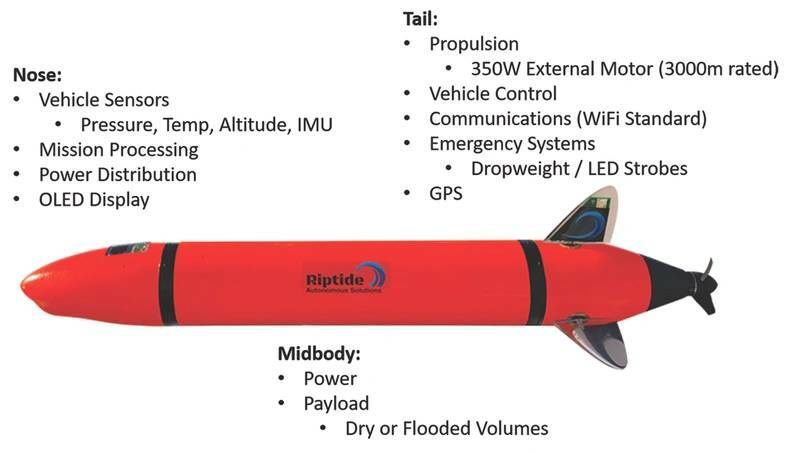 Riptide’s first product was the micro-UUV, a new, flexible, open source autonomous undersea vehicle that provides a state-of-the-art, low cost solution suited for developers of autonomy and behaviors, power systems, subsea sensors, and other new payloads. The micro-UUV features open hardware and software interfaces giving users a reliable and robust platform to advance technology development. The vehicle design is optimized for high efficiency with the best hydrodynamic signature in its class. The base micro-UUV is 4 7/8 inches in diameter, 40 inches in length and weighs 22 lbs. The standard system is rated to a depth of 300 meters. Riptide’s micro-UUV features three individually actuated control fins providing active roll stabilization. An active GPS antenna, WiFi communications and vehicle recovery strobe LEDs are integrated into the vertical control fin, reducing the vehicle’s hydrodynamic signature for maximum efficiency. Open system design provides for easy user modification and customization, making this an ideal platform for a wide variety of development needs. Multiple energy source options allow maximum flexibility for endurance, safety, shipping and mission optimization. In contrast to typical proprietary architectures, the micro-UUV features a flexible software architecture leveraging a large amount of open source software. The goal is to foster an active and vibrant user community who will be provided with source code under a standard open source license. The micro-UUV architecture maximizes the use of existing open source software, both to provide a mature platform and to tap into existing energetic user communities. In the initial release of micro-UUV software, Riptide is providing code for the Arduino and Beaglebone Black development platforms, as well as support for the MOOS-IvP robot control engine. Future releases are planned to include support for ROS (the Robot Operating System) and streamlined user interfaces. In addition to embracing current software development trends the micro-UUV has been developed using a large quantity of 3D printing. This has enabled affordable and quick evaluation of numerous design considerations. This rapid manufacturing capability has also enabled Riptide to quickly field production vehicles. This approach is not just for engineering models. It is delivering product capable of withstanding the pressures and harsh environment of UUV operations. The use of modern design and manufacturing techniques has also enabled the development and delivery of numerous micro-UUV configurations. A variety of sensors, as well as wet and dry payload bays, have been rapidly developed and successfully delivered. All has occurred within 15 months of the first conceptualization of the product. The micro-UUV was designed for low logistics. The standard configuration uses 144 alkaline AA batteries just like a television remote control but in greater quantity. They can be swapped out in minutes. The use of alkaline batteries avoids many of the limitations and restrictions with shipping, safety, and government certification of lithium batteries, while providing enough energy to run these efficient vehicles for a day or more, depending on operational speed and payload power. In addition to flexibility in shipping, deployment is simplified with a vehicle of such small size. There is no need to rely on large, expensive surface vessels. Operations from the dock, from dinghies, and even from paddleboards are possible. The development of the micro-UUV has been remarkably quick, and users have been equally fast to put it to the test. Several key milestones in 2016 were driven by U.S. Navy interest. In March 2016 the first three production micro-UUVs were delivered to SPAWAR Systems Center - Pacific. These vehicles were configured with a flooded payload module to enable rapid payload development and demonstration. In July 2016 six micro-UUVs were delivered to the Naval Surface Warfare Center Panama City Division (NSWC PCD). These vehicles were configured with a dry payload volume that will enable the Navy to test various new sensor systems with these small flexible vehicles. During the week of Aug. 22-26, 2016 Department of the Navy scientists and engineers collaborated on Government Acceptance Testing (GAT) of the micro-UUVs at NSWC PCD. Technical personnel from NSWC PCD, Naval Undersea Warfare Center (NUWC) Keyport and Space and Naval Warfare Systems Center Pacific (SPAWAR) worked to evaluate the systems against the U.S. Navy’s requirements for specific mission areas, including mine countermeasures. A bench test was conducted to ensure sensors and other aspects of the UUVs worked properly and during the latter part of the testing week, the engineers operated and tested the UUVs in the intended salt-water environment. The goal of this collaboration was to better understand the product and how it applies to the science and technology work done at NSWC PCD, as well as other Navy labs. The GAT concluded that the micro-UUVs will be beneficial in a variety of research and other missions that would be more difficult for larger UUVs. Currently the systems do not match the capabilities of Fleet vehicles but once testingis complete, the engineers can reconfigure the systems to meet their evolving needs. Current Fleet vehicles and most commercial UUVs offer a very low level of autonomy, in which every single action must be programmed in advance. With their new micro-UUVs NSWC PCD scientists and engineers are experimenting with higher levels of autonomy and moving toward communicatingwith a UUV to teach it how to survey the area on its own without laborious step-by-step advance programing. Navy researchers are looking forward to using the micro-UUVs for autonomy research and believe the flexibility and ease of use of this new tool will rapidly advance new ideas for consideration by the Fleet and wider UUV user community. While the current micro-UUV capabilities are exciting it is the potential to dramatically expand their range and endurance, without increasing size, which will truly disrupt the UUV market. 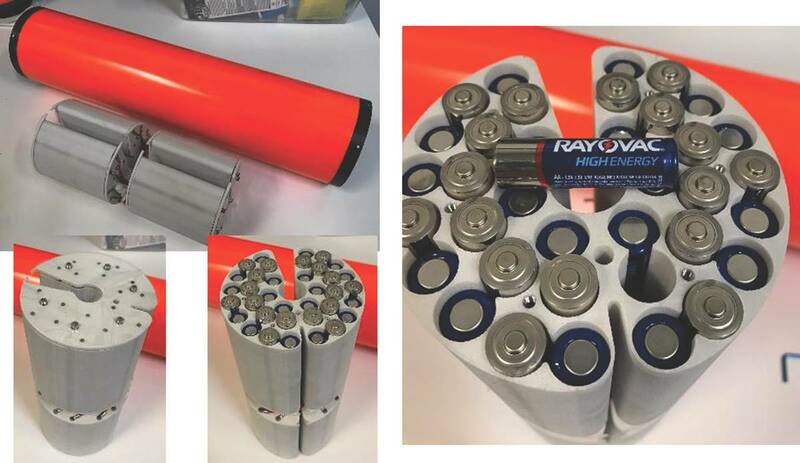 Currently 144 alkaline AA batteries are used in a standard micro-UUV. This provides approximately 300 Wh which, with no payload, running at peak efficiency gives the micro-UUV a range of a little more than 100 nautical miles in 36 hours. This presumes an operating speed of 2.8 knots. At 0.5 knots the same vehicle configuration can run for three days. With a suitable compact side scan sonar operating, at optimal efficiency the vehicle has a range of 72 miles in 20 hours at a cruise speed of 3.6 knots. This performance is adequate for many applications, but it can be improved upon. Through an exclusive partnership with Open Water Power Inc. the micro-UUV will pioneer the use of aluminum seawater batteries. This new technology harnesses the energy of a chemical reaction between seawater and carefully treated aluminum alloys. The result is an inherently safe energy storage solution with a dramatic increase in energy density. With the use of this new battery technology the endurance of a micro-UUV can be extended well over 10 times the current production capability. An ability to survey up to 1,000 linear miles with side-scan sonar, with a hand-held vehicle, is nearly here. Like the micro-UUV the Open Water Power solution has received significant interest from the U.S. Navy and is in its early phases of delivery. Prototype demonstrations in the micro-UUV are anticipated during the summer of 2017. The micro-UUV has a starting price of $10,000. This degree of affordability will allow for an even greater expansion of the market, reducing the barriers to entry for vetting new sensors and new applications. It also enables larger quantities of vehicles to be cost-effectively deployed. Coupling this highly affordable solution with a significantly longer persistence made possible by Open Water Power’s breakthrough in energy density will allow for even greater capabilities to be fielded. Power hungry sensors can be tested from smaller, lower logistic platforms. Longer endurance missions will require advances in autonomy that can more affordably be validated without risking high cost systems. In a domain where high costs and short mission durations have been commonplace, Riptide is offering game changing alternatives to these past obstacles with its first product, the micro-UUV.